A rendering of the proposed building by Marvel Architects. 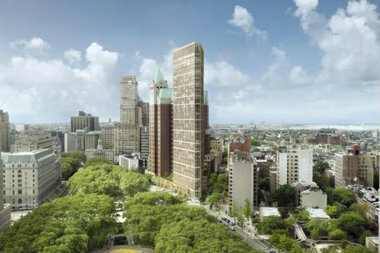 BROOKLYN HEIGHTS — A controversial plan to sell the Brooklyn Heights Library site for $52 million to a developer that will build high-rise condos with space for a new library was approved by the City Planning Commission on Monday. As part of the deal, the developer will also build offsite affordable housing. The commission voted unanimously, 10-0, in favor of the plan, with two members, Michelle De La Uz and Joseph Douek, recused due to conflicts of interest, the Department of City Planning confirmed. The deal will next go to the City Council. The plan to sell the freestanding library building to Hudson Companies, which would replace it with a modern condo tower housing new but smaller library facilities, was approved by Community Board 2 in July despite community opposition, including from Brooklyn Borough President Eric Adams. Adams conditionally disapproved of the project in September, saying it should include new public school classrooms and more permanent affordable housing. The city planning department said it requested the offsite affordable housing generated by the project, which will be located at 1041-1047 Fulton St. in Clinton Hill, be permanent. Madeline Kaye, a spokeswoman for the Brooklyn Public Library, called the deal "a win-win." "In addition to bringing a new state-of-the art library to Brooklyn Heights at no cost to BPL, it will also help to alleviate the system's capital crisis by generating more than $40 million that will be invested in libraries throughout the borough," Kaye said in a statement. City construction unions have been knocking on doors to try and secure prospective jobs as union, according to Politico.